Bring the warmth of the beach to your guests all year round with a shell design wine stopper favours. 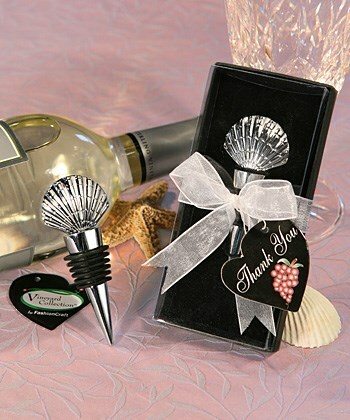 Just right for a beachside event or any special occasion, these shell design wine stoppers are true show stoppers! The symbolic and elegant chrome scallop shell is perfectly perched atop each 3.5" x 1.5" chrome wine stopper designed to be sleek and practical additions to your guests' homes. Each chrome wine stopper is beautifully packaged in our signature clear box with a black bottom, elegantly finished with a white organza bow and designer heart shaped thank you tag attached.